The 377-horsepower Vauxhall Lotus Carlton was powered by a twin-turbocharged, 3.6-liter, inline six-cylinder that produced 419 lb-ft of torque, or enough to go from 0 to 100 mph in under 11 seconds, with a top speed of 177 mph. This was more than enough to escape the grasp of UK police in the early ’90s, whose cars topped out at 90 mph. We’ve written about this before, but as this Car Throttle video nicely explains, the Vauxhall Lotus Carlton was, in its time (1990-1992) faster than the contemporaneous versions of the BMW M5, the Ferarri 348, and the Porsche 911 Turbo. 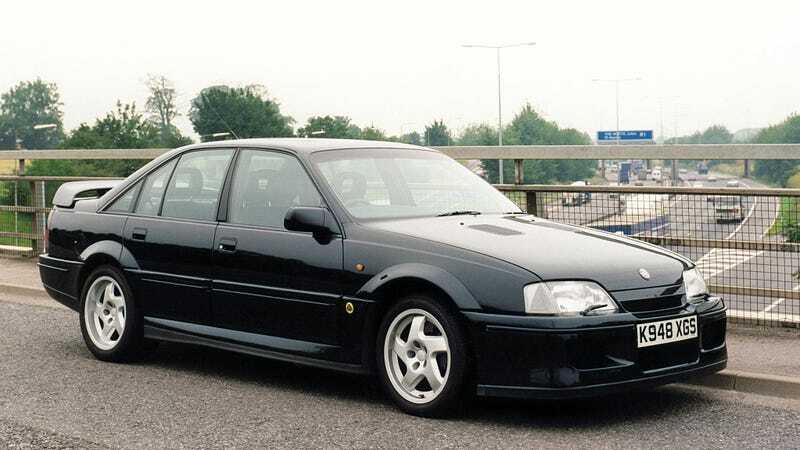 The Carlton (a Lotus-tuned version of the humble Vauxhall Carlton, also known as the Opel Omega, which later came to America as the Cadillac Catera) was also rare, with just 950 ever built. The thefts were known as ram raids, in which a car would plow into a storefront, steal loot, and take off in the Carlton. The perpetrators were never caught, in part because of the lack of power of U.K. police cars and in part because of a policy of not always pursuing high-speed chases. “We simply haven’t been able to get near the thing and it looks unlikely we ever will,” a police spokesperson said at the time. The car wasn’t cheap—retailing for £48,000, or about $120,000 today—but for the thieves, that was no issue, as the Carlton they used was, naturally, stolen. They are said to have made off with £20,000 worth of cigarettes and liquor in the United Kingdom in the course of the thefts, which, on balance, doesn’t quite seem good value compared to the Carlton’s worth, all of which is not to mention the legal risk. At any rate, hot damn does the Carlton still look good after all these years. I’ll take one (1) please. And if any heists happen in my city after that, you didn’t read this blog.